My last post featured #6 - 10 in Brody's recommendations for the best attractions in Disney World for a toddler and / or preschooler. Here is Part Two! 5. 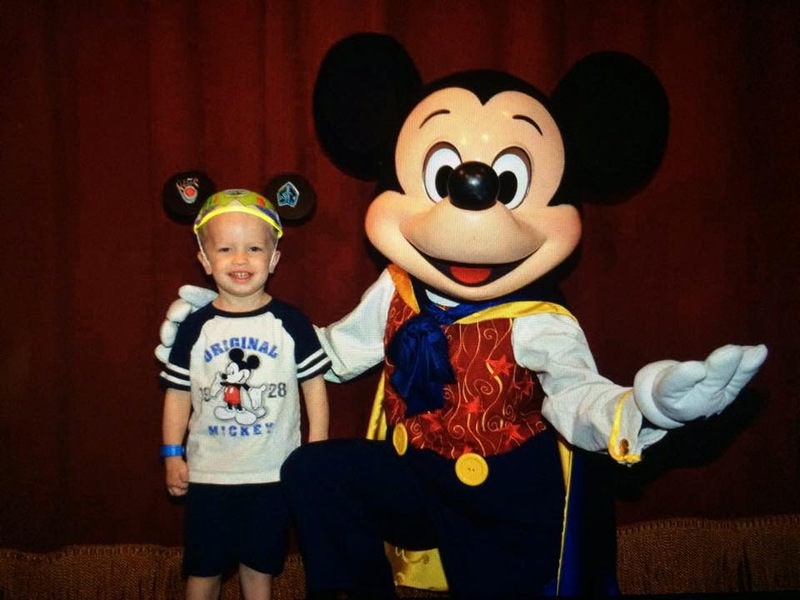 Meeting Characters - Whether it was at a character breakfast or in the parks, Brody loved meeting some of his favorite characters. This can be tough to judge on your first visit to Disney with little ones. I think Brody was more comfortable since he met a lot of characters last year on the Disney Cruise and our short 3 day visit to Disney World. We didn't have to wait in long princess waits, but did wait several times up to 30 minutes to meet some of his favorites like Woody and Buzz. If you know your kids will enjoy it, and they're not big enough to ride many rides yet, think about using some of your FP+ reservations for these meet and greets. 4. Talking to Mickey at Town Square Theatre - This was a new experience for me this time and it was AWESOME! 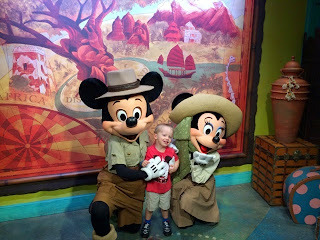 Brody met the talking Mickey on Day 4 of our trip. 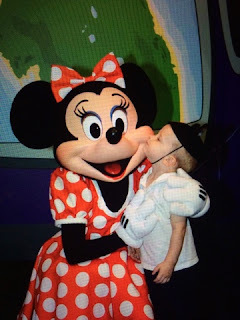 He was amazed after meeting Mickey a few other times who couldn't talk. Mickey also took his time and was very interactive. 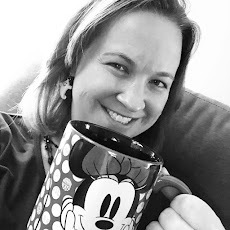 Thrilled to talk, sing, and spin around with Mickey at Town Square Theatre! 3. Cinderella's Castle - Or the "Disney Castle" if you're Brody. He's talked about the castle for months leading up to the trip as he knows it from the beginning of Disney movies. His face was priceless as we started walking down Main Street USA and he ran up to the castle several times to give it a hug! Seeing Cinderella's Castle when you start down Main Street USA = Priceless! 2. 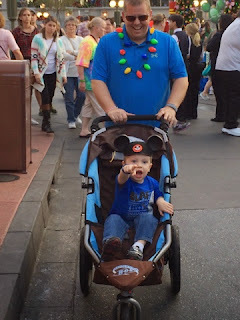 Riding Disney Transportation - Who would have thought that the part of the trip that most adults find to be the biggest pain, would turn out to be among Brody's favorites? Maybe it's because of a lack of public transportation where we live, but Brody was fascinated by the busses and the monorail. He would get so excited when we told him it was time to ride on a bus and also loved waiting at the bus stops. He would ask what seemed like a million questions about where each bus was going while we waited for ours. He is still talking about the busses and how much fun they were! 1. 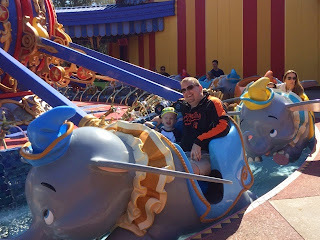 Dumbo The Flying Elephant - A Magic Kingdom classic, this ride was Brody's favorite. He loved going "way up high" and the "way down low." It's perfectly designed for the preschool set and we must have rode it at least a half dozen times. I was excited to see him loving this ride as one of my favorite memories from my first Disney trip in 1989 was riding Dumbo with my grandmother. Sharing old memories and creating new are a big part of what makes a Disney vacation so memorable. So that's it! Brody's recommendations for the toddler and preschool set. If you have any questions, feel free to ask him - he talks about his Disney trip almost every day! !